Eubena Nampitjin began painting at Balgo Hills in 1988 alongside, and in collaboration with her second husband Wimmitji Tjapangarti. She was born at Yalantijirri near Well 33 on the Canning Stock Route and moved to the Catholic mission near the northern reaches of Lake Gregory in 1948. In 1962 the mission moved to Wirrimanu (Balgo Hills) where there was a more permanent water supply and thereafter the community that developed around it became a melting pot of tribal peoples drawn from the cusp of the Tanami and Great Sandy Deserts. The Wangkajunga, Walmajarri, Kukata, Walpiri, Ngarti and Djaru people congregated there as life became more and more difficult to sustain on their traditional land. While painting developed initially under the auspices of the church and the Adult Education Centre, Eubena did not begin painting until the second art coordinator, Michael Rae, began visiting the town camps around the fringes of the mission. Canvases were delivered and collected on a weekly rotation and it was common for husbands and wives to complete canvases together. 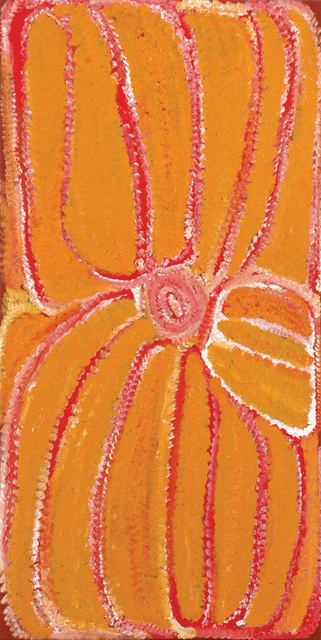 Wimmitji and Eubena initially worked in earthy brown and red toning with areas of white dotting and lines, by 1989 they had begun experimenting with soft floral patterns transforming their complex dotting and compositions in to delicately beautiful and opulent works. (Watson 1997: 52). Their early paintings portrayed Dreaming sites, country and ancestral travels in the most intimate cartographic detail and these paintings are, to this day, the very finest that have ever emanated from the community. As the art centre flourished and demand for their paintings grew, Wimmitji began painting less and Eubena increasingly painted on her own. After the death of her daughter Ema Gimme Nungerayai in 1993, she returned to Well 33 and did not paint again until encouraged to return to Balgo Hills two years later by the then art coordinator James Cowan. From that time on, she painted alone. Her late career work as illustrated above, demonstrated larger, freer dots and a more gestural style executed principally with a palate of red, yellow and pink. In time these became more akin to finger painting with fluid brushstrokes and only the occasional intimate section actually dotted with a stick. In many of her most recent paintings the dots have become so gestural and painterly in their application that they are more or less indistinguishable. She has also combined blue, lilac and vibrant red in duotone works with white in a number of paintings created during 2007 and 2008. These paintings, especially when large, exhibit a haptic rhythm that excites the beholder and as a result, fetch a premium when sold in both on the primary and secondary markets. The distinctive vibrancy, sense of raw energy and trademark use of vibrant colour, bold patterning and rough and ready handling in Eubena’s works create an “extraordinary sense of presence,” that overrides any connotations of the work as an object of anthropological significance and invites the viewer “to appreciate pictures for their immediate visual impact as works of contemporary art,” (John McDonald 1995). She is now Balgo’s grand matriarch and ‘number one’ painter whose works are always in great demand both in Australia and internationally. Now in her 80’s she is close to the end of her career. Nevertheless, her energy seems indefatigable and she continues to regularly produce gestural, if often fairly repetitive, works that are sold through major exhibiting galleries for premium prices. Her fortunes at auction have been mixed since the beginning of 2004. Prior to this her career success rate was 70%. While her 2004 results saw this drop to 65%, with only 9 of the 16 works on offer selling, it was by far her most successful year in terms of turnover generating $214,359 in sales. Since then 49 paintings have been offered of which 31 have sold with 2008 being her most disappointing year during which only 7 of 15 works found a new home. With most of the failures carrying estimates above $25,000 and as high as $80,000 these results are clearly indicative of an overheated market for the works of an artist who is still actively, and prolifically, painting. As with the work of other first generation Balgo painters, Eubena’s early works are undervalued given their historical importance and aesthetic quality. This is unlikely to last. Just as 1970’s Papunya works were replete with ceremonial knowledge and intimate detail, so too were 1980’s Balgo Hills paintings. Over time, as the market becomes more knowledgeable, Eubena Nampitjin, will be recognised as the ‘great matriarch’ of an artistic legacy that spread during her lifetime, from the Great Sandy Desert and the Canning Stock Route throughout the Southern reaches of the Kimberley.